Caring for our existing trees and planting more trees will benefit all of us. Planting native trees, adapted to our local environment, particularly those that are resistant to pests, drought and pollution is always preferred to introduced species which often contribute little to our ecology and the web of life that sustains us. 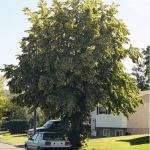 This document provides a compendium of native tree species that should be planted, ideally in large numbers, to help restore the urban forest. 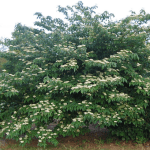 The Alternate-Leaf Dogwood is the tallest (almost tree-like) of many attractive native and under-utilized Dogwoods. 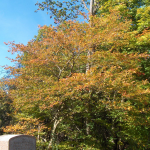 It is also called Pagoda Dogwood for its attractive horizontal tiers of branches on older trees. Its berries are a favourite food of summer songbirds. Note: To provide understory species like Alternate-Leaf Dogwood with even moisture all year long, mulch well with 8 cm (3 in) of bark mulch, or plant near the sloped edge of a water feature where the roots can access water in the heat of the summer. 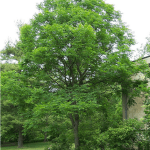 Basswood is a handsome and large shade tree, which should be planted more extensively than it is. Bees love Basswood flowers because they bloom in midsummer, when few other trees are in bloom. 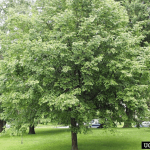 Bitternut Hickory resembles an ash tree from a distance and could be a good “ash substitute” now that ashes are disappearing. The nuts, as the name applies, are inedible. 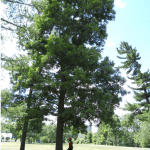 Bur Oak has been commonly planted in Ottawa where it achieves massive dimensions due to tolerance of urban conditions and inherent longevity. Mature specimens look rugged from a distance, like “haunted house” trees. It is little affected by air pollution. 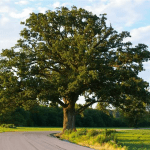 Bur Oak should be planted more due to its combination of strong wood, urban tolerance and freedom from pests. Note: The Bur Oak’s roots grow deep into the soil, so plant it where there are no underground pipes. 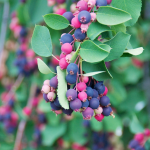 Chokecherry is a small tree or tall shrub with attractive foliage and fruit. It is most noticeable in flower, with many dense, white, elongated clusters of 5-petalled flowers, which then become clusters of round shiny fruits, varying from yellow to red or almost black. The fruit is an important food source for birds. Chokecherry is a good candidate for more extensive planting. Note: Chokecherry can be trained as a single-stemmed tree but will often sucker from the roots at the base of the stem. To reduce root suckering, carefully tear the young shoots off with your hands instead of cutting with sharp tools. 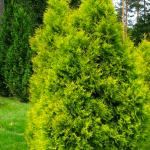 A native, small, hardy, slow-growing tree. It usually lives for about 200 years but can occasionally live much longer. Found both as tree and hedge row or shelter belt. Dense foliage down to ground level obstructs visibility. Needs protection from soil salt and road salt spray from vehicles. Hawthorns are useful for their ability to tolerate dry, windy areas, but due to sharp thorns, are not recommended for schoolyard plantings. The loggerhead shrike, which is critically endangered in Canada, prefers Hawthorn-rich areas as its habitat because of these thorns. Like crabapples, Hawthorn fruits contain high levels of pectin and have been used to make jams and jellies. Hawthorns make good candidates for more extensive planting. Hop-hornbeam or Ironwood is another relative of the birches. This tree is called Hop-hornbeam because the maturing clusters of fruit look like hops. Hop-Hornbeam is a slow-growing tree adapted to many situations, except on waterlogged soils where the similarly sized Blue-Beech thrives. Note: If planted in full sun on lighter soils, will benefit from a large ring of bark mulch up to 8 cm (3 in) deep and supplemental watering to prevent leaf scorch in midsummer. 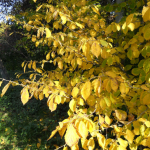 The Hornbeam, also known as Blue-Beech, is a relative of the birches and is an attractive understorey tree. Blue Beech is also called Musclewood for its muscle-like ridges on the smooth-gray trunks. Good candidate for planting in shady places. 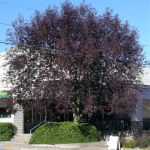 A native tree that is adaptable to a wide range of conditions, and tolerates city conditions. Very disease free. 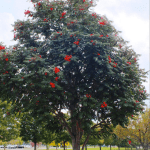 Native Mountain Ash species are small northern trees, uncommon near Ottawa (although the non-native European Mountain Ash (Sorbus aucuparia) is common in Ottawa). The fruit is a favourite food for overwintering birds. 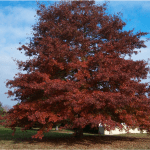 Red Oak is a large shade tree that can grow well on good soils, while naturally growing in drier upland conditions. The Red Oak needs room to grow – it can tolerate shade when it’s younger, but needs full sun as it gets older. It doesn’t grow very well if it’s close to other trees. Serviceberries is a group of similar species related to apples (Rose family) and are becoming commonly planted for their tasty and edible fruit. Serviceberries are a very adaptable group of species, attract wildlife and offer beautiful fall colours. Serviceberry fruits were a staple food of the Cree tribes of the Prairies, who mixed the dried berries with buffalo meat to make pemmican. 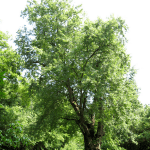 The Silver Maple is a large, fast-growing tree and, although naturally a swamp and flood plain specialist, it can grow well on drier sites and tolerate soil compaction. Should not be planted close to foundations. The Silver Maple is very similar to the Red Maple. It’s a large tree, so make sure it will have plenty of room to grow. 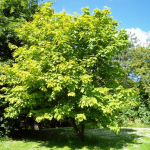 The Striped Maple has large, beautiful, distinctive duck-foot-like leaves and striped green-white bark. The leaves turn yellow in the fall. This is a small understorey maple, a bit fussy about soil conditions and growing environment, and well adapted to a cool understorey. 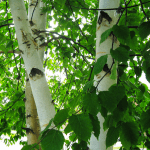 White Birch is also known as Paper Birch and Canoe Birch. It is the white-barked native birch of forests near Ottawa. White Birch trees are often used in landscaping because they will grow almost anywhere as long as they get enough sunlight. (Not European Silver Birch which is vulnerable to the Bronze Birch Borer). Note: The non-native European White Birch (Betula pendula) is frequently planted but is very susceptible to the native Bronze Birch Borer. 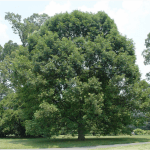 The White Oak is a large shade tree with valuable wood, very pale mature bark and edible acorns. It can live for several hundred years. The White Oak is somewhat cold-sensitive yet hardy at Ottawa and, with global warming, this tree makes a good candidate for more extensive planting. Note: With its deep rooting system, it should not be planted close to septic tanks or drainage tiles. Witch-Hazel is an attractive small tree, that is notable for flowering in late autumn. It is a good candidate for planting more extensively in Ottawa. Witch-Hazel is somewhat pollution tolerant and relatively trouble-free. 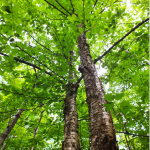 Yellow Birch is an attractive deep-forest species, often growing in association with Beech, Sugar Maple and Eastern Hemlock. It grows slowly and lives about 150 years. Is there a specific nursery where I can buy these trees please?